This post is part of a series called How to Draw Natural, Textured, Afro Hair. In this tutorial, we're going to discuss the basics of drawing natural, afro textured hair types in line, including different variations and scenarios. Keep in mind, even with this information, one of the best ways to observe a subject is to do just that: observe. When in doubt, take a look at references! Hair is often separated into "types". We're going to focus on Type 4 hair in this tutorial, which tends to be the most curly and coily. "Type 4" generally refers to the Andre Walker Hair Typing System. This system is often used as a general classification for identifying hair's attributes (and it isn't without its flaws and valid criticisms). It has been further adapted by and expanded upon by others, as well. Since this system is widely used and referred to, we'll use it as a starting point in this tutorial. For reference, Type 1 refers to straight hair, Type 2 to wavy, Type 3 to curly, and Type 4 to coily. Notice how, as you move across the scale, there is an increase in volume and density. First, let's talk about volume. In this case, I'm referring to volume in respect to how much space our subject—in this case, hair—occupies. You might hear the words "thickness" or "fullness" associated with hair's volume. Generally speaking, hair in the 4 range tends to be quite voluminous. Let's look at this in terms of primary contours, or the outermost silhouette of the hair. "Afro" as a style is often visually portrayed as a perfect circle. However, as a woman of color with an afro, I can tell you—that's not how my hair naturally looks. One could style their hair this way, but it's not exclusively how all coily hair looks. Even then, it's not a plastic sphere or something like that—there is typically texture and variation. I recommend working with varied lines to achieve contours that feel natural. Let's start with a very geometric concept and observe how some varied line work can make for a more organic aesthetic. I wear an afro almost every day, myself —it's my favorite look! Here's a look at the different ways that my curls, personally, generally vary in appearance, based on some simple, everyday scenarios. Again, please note that no two people are exactly the same, and neither is their hair! These are my experiences and my take on illustrating this hair type in a stylistic way. Use these insights for inspiration, but not necessarily as a catch-all replacement for reference. First, this is how my hair looks naturally, when dry, and with minimal product (such as styling gels) applied. I tend to have a lot of volume because my hair is pretty long. I visually broke this down into more simplistic contours. Notice how it doesn't just "fall downwards". I get a lot of big, beautiful, fluffy height and width! Parting the hair can also affect its appearance, weight, and volume. In these examples, the hair has been parted down to the scalp. Note how the curls tend to "clump", and there is an overall fluffy, soft appearance to the hair (cute, right?). When parting coily, thick hair, you don't necessarily lose volume, even if the scalp is visible. My hair doesn't necessarily "go flat" when it's wet. It tends to fall more onto my shoulders, but still keeps some of its volume. Often, I feel like my hair is rather sponge-like in that it really takes a lot to get it thoroughly wet! For example, my hair might feel a little "limp" if I get caught in the rain, but it doesn't compare to being fully saturated with water in the shower. My hair often takes a long time to dry, if I allow it to do so without any kind of styling tool. Coily hair, especially tighter coils, will often experience "shrinkage". For example, I can pull one of my curls taut, and it looks a lot longer. As an example, when pulling the hair back, notice how the volume stays in the "puff" at the back. Tools like a flat iron can be utilized to straighten natural hair. Note, however, that the hair looks longer when it's styled this way. Again, keep in mind that afro textured hair is curly—it will often appear longer when those coils are straightened out. Now, let's take a look at what those insights mean in relation to different types of coils in the Type 4 range. Again, please keep in mind that no two people are exactly alike, and the same goes for their hair! Some might be a combination of more than one hair type, and different styling can also change the hair's volume and appearance. These insights are meant as a potential frame of reference and not a rigid rulebook. Let's start with 4A hair qualities. Generally speaking, these curls are more likely to have a visible curl pattern—you might see pretty, S-shaped curls in the hair, for example. Keep in mind, however, that these curls are still going to be tight, voluminous curls. Looser curls would likely fall more in the "Type 3" range. When drawing this type of hair, I like to put more emphasis on pattern and flow. While all Type 4s tend to have a lot of volume, I've personally found 4As to often be a little more "bottom heavy" towards the shoulders, as the hair gets longer. I like to focus on accentuating those curls when drawing this hair type. We're not working with value or color in this tutorial, but these aspects can still be implied with line. 4B hair qualities often have beautiful, tight coils that are more densely packed. This hair type tends to have a lot of shrinkage. When looking at the hair, as a whole, the curls will often look less defined (unless styled to do so!). Instead of an S-shape, these coils are often associated with a Z-shape. Again, I've blocked out simple, primary contours, but this time, notice how the volume is a little "higher" on the head. Keep in mind, again, that the curl patterns are generally not as defined in this hair type, by default. I like to think about this in terms of soft, varied sections. 4C hair qualities often have even denser curls; these gorgeous coils are voluminous, thick, and often have even more shrinkage. In this case, there's very little visible curl pattern (unless styled that way). You may have noticed that the curls have gotten tighter with each step, within the 4A, 4B, and 4C scale. That said, I would approach these curls in an even more "whole" fashion. Put the emphasis on organic contours that simulate a full, soft aesthetic. Again, keep in mind that we're moving up a scale here. So 4C represents the tightest curls we're going to look at. The outermost contours aren't quite the same as we saw in 4A. While this will vary based on hair style and cut, I like to think of it as more even weight distribution on the skull. Let's bring everything together in one stylistic drawing of a character with hair that has 4C, coily qualities. Start by blocking out the basic features of the facial area. Keep the skull in mind; since voluminous hair can have varied contours that fall far from the skull, I like to make sure to reference these points. This way, I don't run the risk of drawing a head that has odd proportions. Hairlines, as with any hair type, can vary from person to person. For example, you might observe a squarish shape or a round one. In this illustration, I'm going to block out a round shape. As with any hair type, it's important not to draw in a haphazard fashion. Coily hair still grows outwards and still has a methodology to it. I've used basic cross contours here to illustrate how I picture the general shape of the hair. Think of cross contours as lines that travel across a form in three-dimensional space. We won't necessarily keep these lines in our final drawing, but they can be helpful in observing depth. Note the lines in blue that illustrate the direction the hair generally flows and sits on the head. If, for example, one were to fill this space with randomized lines, it would run the risk of looking chaotic and unnatural. The blue space is the "front" of the hair. Now that we have a feel for how the hair sits on the head, let's try parting the hair. Again, keep in mind that this doesn't mean a loss of volume, but it would change how the volume is distributed. Since I'd like the hair to look thick, with tight, dense curls, I'm not going to focus on individual curls here or presenting a specific pattern. Instead, I'm going to put the emphasis on establishing soft "clumps" of hair. I recommend keeping organic lines and shapes in mind—varied lines are going to look more natural. For example, coily hair isn't straight, so I like to avoid using straight lines. Just like the outer silhouette of the hair, the hairline could benefit from organic variations in line that further reinforce the movement and texture of the hair. While dense curls might not have a clearly visible curl pattern within the hair, I like to use the hairline as a place where I can define some texture and add detail. Again, the hair here isn't perfectly straight, so I like to avoid using straight lines. Varied lines can help visually reinforce the hair's texture. We're not going to look at value or color in this tutorial (we'll cover that in another one! ), but concepts like texture and depth can still be implied with line. But how? How do you know where to put what lines? Again, I like to block out the basic shapes to help me understand the form in a three-dimensional space. The blue is the front of the hair, the pink is the top, and the green is the surface area visible by the parting. Using these as my guide, I could add some additional lines to help imply some detail. 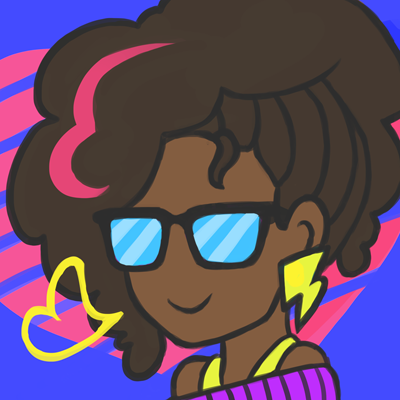 We've created a line drawing of a character with curly, afro textured hair! Use these insights to draw your own characters with varied, coily hair types—and don't be afraid to add your own flair! Illustration can be expressive and stylistic while still drawing from real-life qualities. Enjoy! If you enjoyed this tutorial, here are some others that might interest you! Happy drawing!